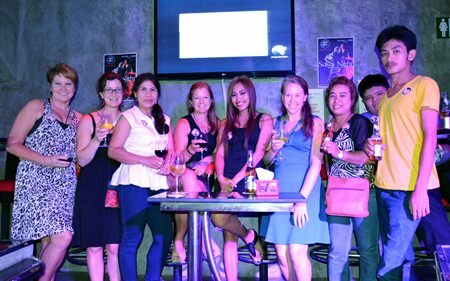 A very special “Souled Out” party was held on the evening of Saturday 8th November at the Access Inn on Pattaya 3rd Road…. special, because it was the Pattaya Soul Club’s 3rd anniversary (seems hard to believe that it’s three years since the inaugural event at Play Club) and a tribute to Claudio Ghirardi, Souled Out’s resident DJ, who passed away suddenly in July. The night was, arguably, the “best one yet” with a great crowd of regular and new supporters of Soul. The “Souled Out” night is well known globally and attracts visitors from all around the world, this time we had a visit from Soul of Dubai founder, Steve, who flew in especially for the event and was suitably impressed. 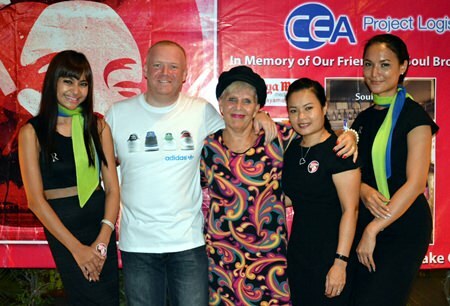 Pattaya Soul Club founders Earl Brown (2nd left) and Eva Johnson (centre) pose with the Riviera Group girls at the anniversary “Souled Out” party on November 8 at the Access Inn, Pattaya. Earl and Eva were absolutely delighted with the tremendous atmosphere, the music and the dancing, which lasted until 1.30 am on Sunday, with Soul fans strutting their stuff right to the end. All in all, a superb night! Hanging loose for another great night of Soul music. The event was sponsored by The Riviera Group, CEA Project Logistics, CSP Construction and Coco’s Bistro and Bar, and without this great support these charity events would not happen. Over 51,000 baht was made on the night which will all be donated to “Take Care Kids”, a shelter for abused children (and in many cases also their mothers). It is a very deserving charity that works hard to put an end to child abuse and trafficking here in Thailand and particularly Pattaya. The organisers wish to thank, once again, the sponsors, the supporters and especially to management and staff of the Access Inn. Watch out for details of the next “Souled Out” in March 2015. 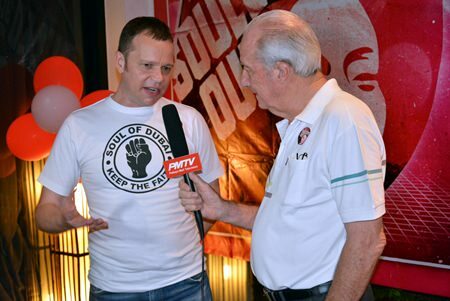 Dr. Iain Corness (right) interviews Steve, from the Soul of Dubai, for PMTV. Next articleLife at 33 1/3: Relaxing or dull?